Is it true that the king used to wear red heels to distinguish from the other well-dressed noblemen? To my knowledge, the red heels, at least in France, were worn by noblemen who had been accepted at court and were in favor with the king. It was one of Louie's ways of keeping tabs on everyone, and making it "public" knowledge who was in and who was out. The Fashion Historian blog has a great article on this - read it here. 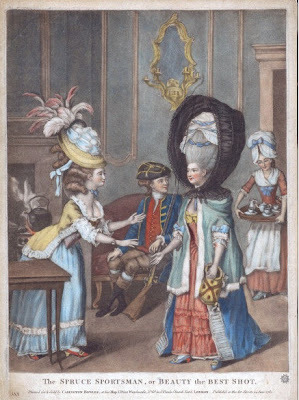 "The Spruce Sportsman" showing fashionable dress for the year 1777. From Two Nerdy History Girls blog. You can see on the tiny feet of the ladies pictured that the heels of their shoes are colored differently than the rest of the shoe, and the lady on the right wears red heels. Now, this is a satirical print, and it's entirely possible that the artist or the colorist (for they were likely two different people) took liberties. Does anyone know if court ladies wore red heels? 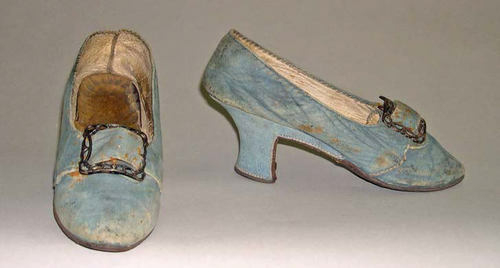 I know that Louis heels aren't the only historically accurate ones but they are SO very appealling. And it's what people associate with this period. In fact in the early 1990's when historically inspired gowns were far more fashionably mainstream than they are now (possibly due to Dangerous Liaisons the movie), we could buy or have made in our own fabric, bridal shoes very close to the style you are doing as a matter of course. So dear Duchess, please think hard about skirting the Louis heel as I really think that it will help you to sell all those 200 pairs lickety split! Mrs C, you are absolutely right. 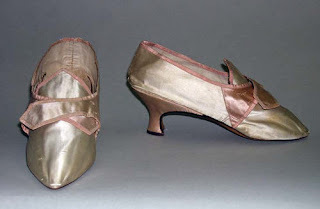 I love Louie heels as well, and I do plan to have them molded for use in the next run and all the other styles from the Victorian up through the 1920s shoes. I agree, they are essential part of period footwear, especially the 18th century shoes. The reason I'm not able to do them this time is that to have the heel molded will cost a couple thousand dollars. I know, it seems silly that it should be so much, especially when we see this style of heel still being used today. There is always some give-and-take with manufacturing, and until I have some capital to put back into this budding business, I have to compromise. The next release of 18th c. shoes will have the louie heels, and will also very likely be in leather - the future Victorian slippers and boots will have them too, as will the 1920s pumps I'm dreaming about :-). 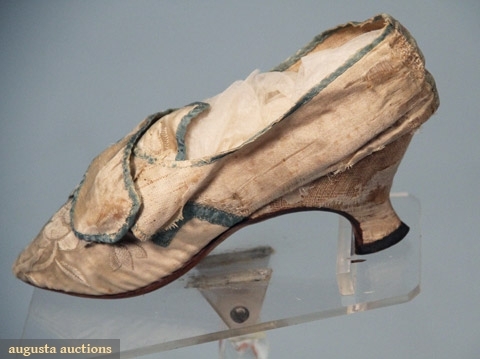 I was very happy to see that the compromise on the current heel feel nicely in with 1770s styles, which will still create a beautiful and historically accurate shoe, even more historically accurate for Revolutionary War and French Revolution re-enactors than the earlier 1750 and 60s heel style. But never fear, I heed your advice, and so long as the first run of 200 does well, we will have louie heels in the future! PS, sorry about the type-os! I am really looking forward to these shoes. 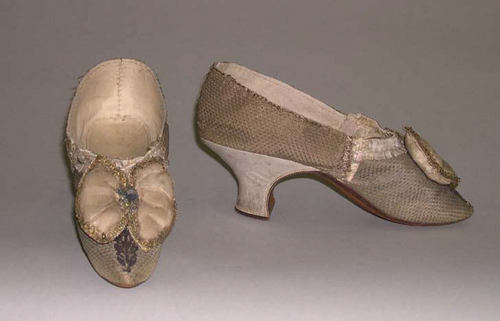 I'm wondering,did anyone see the beautiful shoes featured in Early American Life Magazine Dec issue?? PS this is a very enjoyable blog to visit!!! I haven't seen the article in Early American Life and can't seem to find it online - it's about shoes, I presume? I'm so curious now! 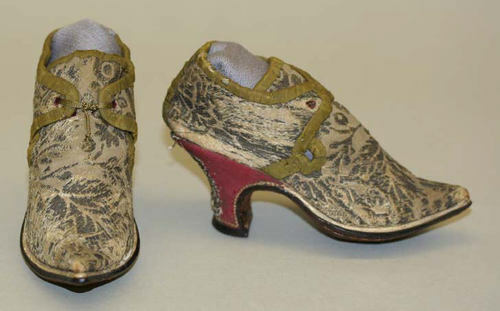 As far as I can tell during Louis XIV reign red heels were reserved for those accepted at court in France. There are many examples of shoes (and portraits), since before Louis XIV's reign, for men and women, outside of France bearing red heels during this time so the same stricture does not seem to have applied elsewhere. 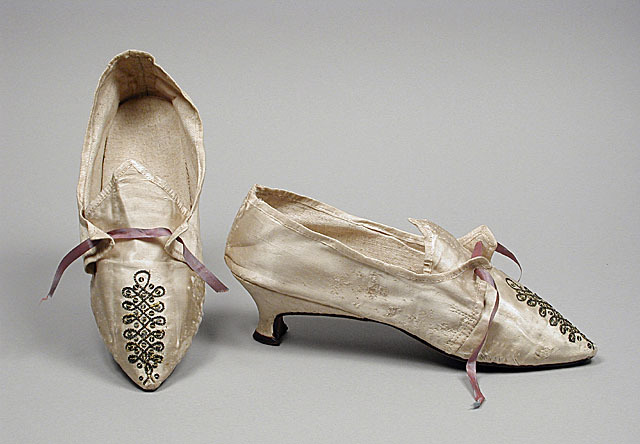 Louis XIV died in 1715 but examples exist from 1720 and on, however it seems that women increasingly chose to have their shoes, heels and all, match or compliment their gowns. 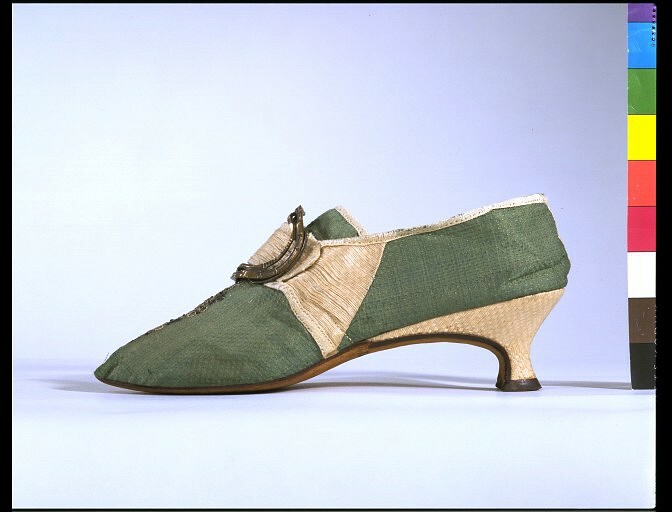 Oh yes shoes:-)12 glorious pages devoted to these historical lovelies! Mrs C, I have a secret surprise for you (and anyone else who reads the comments) - last night I was able to negotiate a very good deal on the custom molds for the french heels. This means the new shoes WILL have proper Louie heels after all, and the price will be about the same! Hysterical happiness re the Louis style with the waist. That's cheered me up and believe me with the floods we have here at the moment I need some cheering up. Any good vibes or prayers gratefully received here in Queensland. We are just one great big disaster area. I'm so happy that we'll be going with the Louis heel!